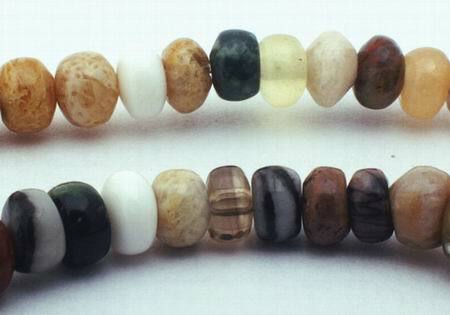 Price is per 15.75-inch strand of these beautiful mixed-stone beads. Made up of different agates and jaspers. Size of beads is 4mm x 3mm (although some in the strand will be very-slightly different size) - about 140 heishis to the strand. Jasper is a crystalline variety of quartz that contains up to 20% foreign material. This is what determines the stone¿s multicolor, striped, or spotted appearance. Jasper was highly valued in ancient times, not only for its beauty, but also for the reputed magical and medicinal properties. In France jasper ornaments date back two-millennia, Babylonians used in for seals twelve-hundred years ago, and in India it has been used for jewelry and building for centuries.